NEW YORK — Outside NFL headquarters, an unusual scene unfolded at the corner of 51st Street and Park Ave. on Wednesday night. There was a protest on the sidewalk, but that wasn’t the surprising part. Rather, it was the subject of the rally that might have been a first: a player being unsigned. A crowd of some 50 people gathered around 5 p.m., careful to stand off private property and inside the barricades set up by the NYPD. About a dozen people spoke over the next hour, sharing personal messages and poetry in support of free agent Colin Kaepernick. Among the demonstrators: Etan Thomas, the former NBA center who spoke out against the Iraq War during his playing career; Emerald Snipes, the daughter of Eric Garner, the Staten Island man who died, in 2014, after being placed in a chokehold by police; and the protest’s organizer, Kevin Livingston, whose Queens-based non-profit, 100 Suits, received a surprise donation from Kaepernick last month. You may remember his social media post standing outside a Queens parole center with Kaepernick, who had dropped off two boxes of his own suits for Livingston to distribute to local men recently released from jail, so they could have job-interview attire. Six years ago, Kaepernick was a second-round selection of the 49ers. Three years ago, he led them to the Super Bowl. Nine months ago, everything changed when he stepped outside the bubble of sports and became a lightning rod for taking a knee during the national anthem—his way of protesting the continued oppression of minorities in the United States. On the same day his supporters gathered in New York (and held demonstrations in other cities such as Chicago and Milwaukee), Kaepernick was in Seattle visiting the Seahawks, who are exploring options for a back-up quarterback behind Russell Wilson. This was the first team visit Kaepernick has taken this offseason, and the first interest any club has formally shown since he and the 49ers parted ways in March. The chances of him landing with a team have seemed less and less as the weeks have gone by and as quarterback depth charts have been filled out via free agency and the draft. There are on-field and off-field factors to consider in the ongoing debate about Kaepernick’s unemployment, but one thing is for certain: he evokes the greatest emotions of any current issue in or around the NFL. That says quite a lot considering other front-and-center topics for America’s most popular sports league are domestic violence, head injuries and the arctic chill from all of New England being directed toward 345 Park Ave. But it’s an undeniable truth. Starting in 2016, as our country has become more divided along political lines, Kaepernick became a flashpoint. His critics didn’t want to hear his concerns about social justice; they only rebuked him for being unpatriotic. Mara said signing Kaepernick wasn’t discussed by his club this offseason, although the Giants never were a likely landing spot for him; they already have a franchise quarterback and were looking to find Eli Manning’s eventual successor in the draft. But the letters Mara received offer a league-wide glimpse into some of the unusual circumstances surrounding Kaepernick’s job search. Blackballed is a strong term, because it suggests a concerted effort among NFL teams to ban a player from the league. But consider the situation another way: A coach who might want to sign Kaepernick would probably have to go to great lengths to convince the owner that Kaepernick is worth the public pressure and won’t hurt the bottom line . . . except his play last season probably wasn’t strong enough to inspire many coaches to make that argument. 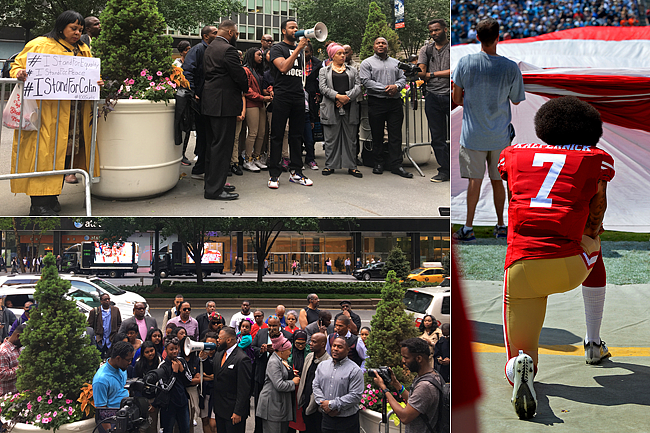 The NYC protest in support of Kaepernick was called a “Show of Solidarity.” It was humble in size, and no one from the NFL office appeared to stop or even pass by. But individual voices from the crowd were strong, and it was hard to miss the two trucks parked across the street with large LED screens displaying highlights of Kaepernick and photographs of him kneeling for the anthem, with the message, “We Support Kaepernick.” There’s enough public pressure against Kaepernick, many of the protestors said, so this was their way of pushing back. They called him a hero and a trailblazer, and they thanked him for waking up their communities and their country. The demonstrators vowed to continue protesting outside NFL headquarters until Kaepernick is signed, and to boycott watching NFL games if he is not. If the Seahawks don’t take him, there’s no telling where he’ll end up or if he’ll even be in the league this season. But the emotions stirred nine months ago still abide.